We know that your dog is a part of your family so we want them to feel as welcome as you are. The Five Arrows Hotel and Restaurant is only a bone’s throw away from the beautiful Waddesdon Manor, making it the ultimate destination for dog lovers and their four-legged friends. Three of our 16 rooms are now dog-friendly, along with the gardens and bar area in the main hotel. Our ‘top dog’ Charles welcomes your dog everywhere in the hotel except the restaurant. Dog treats and attention are always on the menu in our bar area, just ask our staff. You are also welcome to dine with your dog in this area. Each dog-friendly room comes fully equipped with a welcome dog letter, comfy dog bed, bowl, treats and waste bags. A maximum of two dogs per room are allowed, please mention at the time of booking. A supplement of £25 per stay is charged for additional cleaning which ensures there is no compromise on luxury, quality or cleanliness. 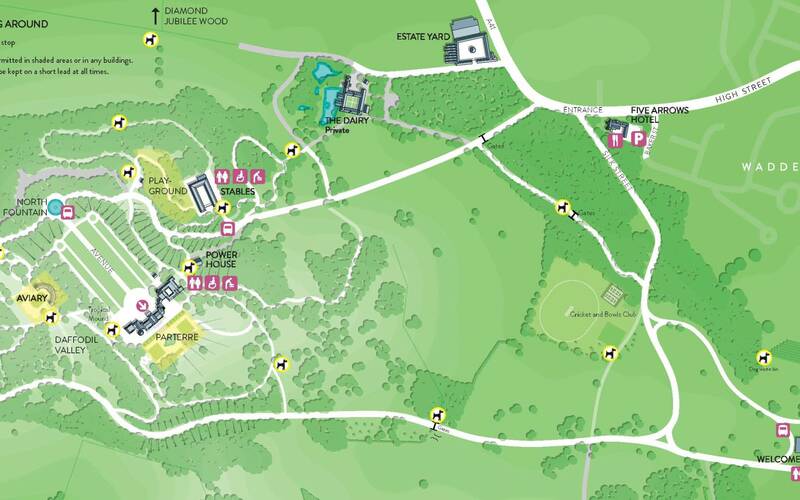 Visit the Waddesdon ‘bringing your dog’ web page for more information about walks in the local area, including a downloadable PDF of the map below, which also shows dog bins. The Walking in England website also has a number of free downloadable walks in the area.